To prevent sleep deprivation in toddlers and help them get a good night’s rest, they need something to snuggle with in bed. A stuffed animal, a warm blanket, or a good fluffy pillow is essential to help your child fall into a deep sleep. It’s not that easy to find the ideal pillow for your toddler, so to help you out, we have listed the 10 best toddler pillows below. It’s important to get your child a pillow that is made entirely of safe materials because they are in the early stages of development. 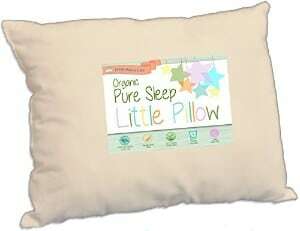 This toddler pillow is hand-crafted with a 100% organic cotton shell, hypoallergenic poly cluster fiber filling, and you can rest assured that it has no chemicals like GMO's or flame retardants. It is also USDA certified. It is soft and is not lumpy at all, even after washing it multiple times, and it is made of high quality materials. It’s approved and recommended by pediatricians all over the world. 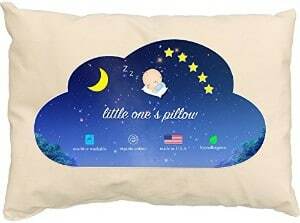 If you find it too soft or too small for your liking, you can contact the manufacturer for a customized pillow made especially for your toddler. What's Great About It: It is made of 100% safe, organic, and chemical-free materials. No pesticides, germicides, fungicides, or GMOs. It’s handcrafted in the USA. This pillow is made just the right size for your toddler. It’s not too soft and has the right firmness that your child will want to snuggle with it every night. It is made of 100% soft cotton, 200 thread count fabric, and a premium polyester cluster fiber fill that will not turn lumpy. You don’t have to worry about ruining the material as it will still remain firm even after machine washing. The pillow is 100% hypoallergenic, which means it will not cause allergies or contribute to flare ups. This pillow is recommended by pediatricians and chiropractors from around the globe, especially if your toddler is at the early stages of development where their neck and head are vulnerable. What's Great About It: It provides long-lasting comfort, made of allergy-safe materials, and will remain soft and firm even after multiple washes. 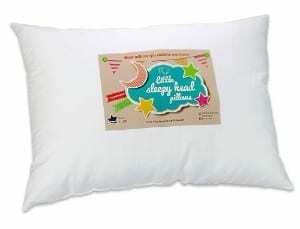 Chiropractors and pediatricians recognize this pillow as the perfect first pillow for your little toddler. It is the perfect size for a small child to snuggle with, and has a dense, soft fiber inside for the best neck support as they sleep. It is made of 100% hypoallergenic materials, and is mold and mildew resistant to ensure that your little one is safe from germs and toxins that could lead to diseases. It is also a poly-cotton blend, so that it can be machine washed and dried without worrying about ruining it. And because it’s not too small or too large, it is perfect for taking with your child anywhere they go. What's Great About It: This pillow is 100% hypoallergenic, is the perfect size for your toddler, and is mold and mildew resistant. It has the right density for the best neck support for your little one. 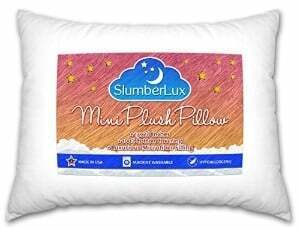 Kinder Fluff is filled with a 100% premium synthetic polyester cluster fiber fill, and is encased in 100% high quality cotton with a 240 thread count that serves as a pillow case, so you don’t need to get a separate one for it. This protects the pillow from disintegrating even after multiple machine washes. It is also the perfect size for your little toddler to sleep on and snuggle with at night, ensuring that their neck is adequately supported and they sleep comfortably. This also supports your child’s head and neck through a car or plane ride. What's Great About It: It comes with a pillow shell made of 100% cotton that is also designed to double as a pillow case. It’s the perfect size to support your child’s head and neck as they sleep. It is safe for machine washing so you can ensure high levels of hygiene for your child. This toddler pillow is made of only hypoallergenic materials so you know your child is safe and protected from allergies and flare ups. It is designed to be just the right size for a growing toddler to sleep on and snuggle with through the night. It provides unbelievable comfort with its soft filling and supports your child’s head and neck, no matter where they use it. And because it’s firm and supportive, you can even use it yourself when traveling over long periods of time. However, it doesn’t come with a pillow case, so you will need to get a separate one to encase it with. What's Great About It: It is made of hypoallergenic and safe materials, and is the perfect size for small children. Adults can also use it because of the amount of firmness and softness. This is another pillow that you can rely on when it comes to giving your child a comfortable sleep and protecting them from allergies and other sickness. 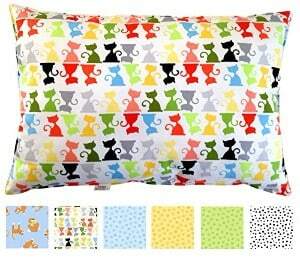 It is made of 100% allergy free materials, and has no flame retardants that may harm your child as they sleep. Its filling is made of 100% hypoallergenic deluxe cluster fiber that will not disintegrate after being washed several times, and it's covered with a double-stitched, soft, 200-thread count percale pillow shell, so you don’t need a separate pillow case for it. 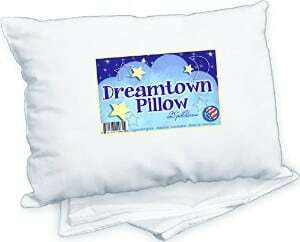 However, if you want it to have a pillow case, the company also sells them separately, available in various colors. You can machine wash and dry this pillow without worries of ruining its soft yet firm body. It is the perfect size, as recommended by pediatricians, so it’s not too big or too small for your little toddler. The fill is also not too hard, so it supports your child's neck without raising it too much. 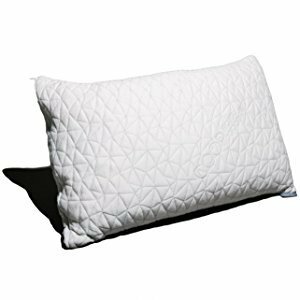 What's Great About It: This pillow is made of hypoallergenic and safe materials, and is the size recommended by pediatricians for comfortable sleep. It is not too hard or firm, so it supports the neck perfectly. This cute and delicately soft toddler pillow will ensure that your little one gets the sleep they need through the night. It has just the right amount of support, and is not too firm or too soft, so that your child finds it comfortable and relaxing. It also makes for a great travel pillow for both you and your child. The shell is handmade with a 200-count thread count and certified organic cotton, so it doesn’t contain any chemicals that may harm your child’s health as they rest. The pillow is also 100% hypoallergenic because it is made of polyester fill so your child is not only comfortable as they sleep, they are also not surrounded by harmful chemicals that may lead to sickness and allergies. It’s also machine washable, making it easy to clean, and you don’t have to worry about ruining the pillow fill. It is made especially for toddlers with the help of chiropractors, but it can also be used by older kids and adults. What's Great About It: The pillow is 100% hypoallergenic, does not contain harmful chemicals, and is super soft while offering enough support for your toddler’s head. It makes for a good travel pillow for you and your child too. This Clevemama toddler pillow is made of ClevaFoam, which offers the perfect support to your little one’s head and neck to prevent Flat Head Syndrome, and helps align the spine and neck comfortably as your toddler sleeps. It’s perfect for toddlers and adults alike. It comes with a cover called the AirFlow fabric, which is a special fabric that helps draw away moisture and sweat, and increases airflow so that it doesn’t get dirty or smelly as quickly as other pillows. This cover is also removable and easily washable. You don’t have to worry about ruining the pillow even after going through multiple machine washes. It is also made with hypoallergenic foam and fabric to ensure that your toddler is safe from allergies and sicknesses. What's Great About It: It comes with AirFlow fabric that stays breathable and dry for long periods of time because it draws away moisture. Everything is made with hypoallergenic materials to ensure your child’s safety. It is scientifically proven to prevent Flat Head Syndrome. This toddler pillow is one of highest quality pillows available, according to pediatricians and chiropractors. The pillow itself provides adequate support for the neck and body of your growing toddler, and it is made of toxin-free memory foam encased in 100% organic cotton fabric. The fabric is made of breathable material that keeps out heat and moisture, so your toddler stays fresh and cool through the night. It is hypoallergenic, antimicrobial, mold and mildew-proof, and dust resistant. It’s machine washable so it’s super easy to keep clean and reuse for as long as your child wants. It is eco-friendly and individually handmade so you know it’s safe. What's Great About It: It is made of toxin-free memory foam and covered in breathable fabric that doesn’t trap heat so your child stays cool. It’s hypoallergenic and antimicrobial, protecting your toddler from allergies and toxins. This toddler pillow by Coop Home Goods is made of 40% bamboo viscose rayon and 60% polyester, high quality materials specially chosen to keep your child safe. It’s hypoallergenic and dust mite resistant, so that it will not trigger any existing allergies or cause one. It’s free of any chemicals and materials that may harm your child. 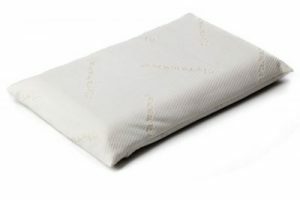 The pillow is made of shredded memory foam that is adjustable to your toddler’s preferences and their needs so that it properly supports their neck and body for perfect alignment and physical growth. It’s soft, cozy, and comfortable, but is firm enough to serve its purpose. The fabric that it is encased in is a breathable fabric that doesn’t trap heat and prevents moisture from collecting so your little one remains cool and fresh as they sleep. It isn’t too high, too flat, too small, or too large – it’s the perfect size for growing toddlers. It’s easy to clean because it is machine washable, and it’s also easy to travel with because it is foldable. What's Great About It: It is made of high quality, safe materials that will not trigger allergies, and shredded memory foam so you can adjust it to your child’s preferences. It’s firm enough to support your child’s body, and comes in a fabric that stays breathable throughout the night. It might look like shopping for toddler pillows is the easiest thing to do. You want something soft, comfortable, and is the perfect size for your growing toddler. Yes, it’s easy to find toddler pillows, but the truth is that choosing the right ones is a lot more than just looking for a fluffy pillow that your little one can snuggle with as they sleep. There are a lot of toddler pillows on the market. They vary in shape, size, softness, firmness, and affordability. They have individual strengths and weaknesses, just like all products manufactured for customer consumption. While some are filled with synthetic materials, others are filled with feathers that might trigger existing allergies and cause your child to develop some. This leads us to one of the factors that we considered in choosing the best toddler pillows to include in our top 10 list. You child’s health and safety is our top priority. For you to know what we went through to ensure that your child only gets the best out there, here are the criteria that we used in determining the best toddler pillows on the market. Of course, the main purpose of a pillow is to provide comfort as we sleep. You want to make sure that your child is comfortable and feeling cozy as they rest at night, so they are not disturbed by the slightest sound we make around them. It benefits the parents too, but most of all, sleep is essential to a growing child’s development as it helps them reenergize for the next day while growing into a strong individual, physically and mentally. The pillow should be soft, but it should also have some firmness to it. It shouldn’t be so soft that it gives in to your child’s weight and doesn’t provide any support at all. It should also be just the right size – not too big and not too small – so that it supports both your child’s head and neck. Some toddler pillows come with pillow covers or shells that are made in breathable fabric that prevent moisture from collecting and trapping heat. This is important, especially if you live in a hot and humid area. You want your child to stay cool and fresh throughout the night as they rest, contributing to their comfort. While some pillows do not offer pillow shells with this technology, you can get separate ones that have this breathable function to ensure your child is sleeping well. Your child’s body is growing, so it needs all the support it can get, especially while it’s resting. It is during deep sleep that the body’s growth hormone is the most active, so this is also when most of your child’s physical development processes take place. You want something that will not only provide comfort and coziness to your child, but also enough support for their neck and spine. The toddler pillow must be soft, but firm enough to keep the neck and body of your child perfectly aligned to prevent back problems in the future. The pillow shouldn’t be too soft, too hard, or too flat. To determine if a pillow is too soft, put a hand in the center of the pillow and then press. If the surface of the pillow doesn’t even change, it’s too soft and unsafe for your toddler’s head. If it take too long to regain its shape, then it’s too hard. Choose something that develops a “dent” when you press on it, but regains its shape in an acceptable amount of time. Comfortable, but firm enough to support your little ones head. So why shop for a pillow specifically for toddlers? Why not just let them use a regular adult-sized pillow? Pillows in larger sizes are generally unsafe for a toddler. Remember, they are in their body’s developing and formative years, and a pillow too large for them will not be able to provide the support that they need while asleep. A toddler pillow should have the proportions right. Just think of shopping for a pillow for yourself. You wouldn’t get a pillow too large for your head, right? Another factor that will determine how safe a toddler pillow is for your child is its filling. Pillows can be filled with either natural or synthetic filling. It’s best to avoid feather pillows because, aside from it being too soft a little child’s head, it can also trigger allergies or contribute to the child’s developing allergies. Pillows that are made of hypoallergenic foam, cotton filling, and polyester are your safest bet because they will not contribute to any allergies, and are usually dust mite resistant. You may have noticed throughout this article that we included the thread count as one of the things we look into when choosing the best toddler pillows. What exactly does the term thread count mean and why is it so important when shopping for a toddler pillow? Simply put, the higher the thread count, the more durable the pillow will be. It will also be more comfortable because it’s less scratchy and is much silkier than those with a low thread count. Another factor is how easy it is to clean the pillow. Let’s face it: children are pros when it comes to making a mess, and their pillow, especially if it has become their favorite, will likely be dirty and will need washing in just a week’s time. It’s better to get a toddler pillow that’s going to be easy to clean. Machine washable pillows are definitely a preference. Do not let your child use a pillow when they are still sleeping in a crib because there is a possibility that the pillow might suffocate them. Very young children still have the tendency to turn face down when sleeping. The best time to give your toddler a pillow is when they’re already sleeping in their own bed, and when their shoulders are already wider than their head. Watch out for signs that your child needs to use a pillow. If your child is always looking for something to rest their head on, like their favorite stuffed animal, or your pillow, this is a sign that they will already be comfortable with their head supported by a pillow. Your child may also have trouble sleeping because they need something to put their head on. Everyone, no matter what age, needs sleep. It plays an important role in maintaining good physical and mental health, and quality of life. While we sleep, our body is still awake, working towards better brain and bodily function. Adults need at least 8 hours of sleep at night to be fully functional during the day. On the other hand, toddlers need a total of 10 to 14 hours of sleep per day because it is during deep sleep that their body secretes the human growth hormone, aiding in their physical growth. It also helps protect children from cardiovascular damage and boosts their immune system to fight off germs and disease-causing toxins that they are exposed to everyday. There is also a study that shows that sleep deprivation can cause kids to become overweight, because sleep impacts the hormone leptin, which signals the brain to stop feeling hungry and stops them from eating. Getting a good night's sleep is important for development, both mentally and physically. Choosing the right toddler pillow for your little one will help them enjoy a peaceful sleep with the correct alignment. Take your time when selecting a pillow for your little one as it will determine what type of mood they will be in every morning.